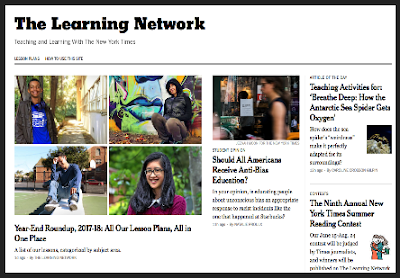 In today’s post we want to draw your attention to this excellent educational resource from The New York Times called ‘The Learning Network’. As a teacher, you can use The Learning Network to access a wide variety of teaching resources and lesson plans covering the following content areas: English Language Arts, Social Studies, Science and Math, ELL and Arts. There are also custom lesson plans on current events. In each of these content areas you will find lesson plans organized into different categories each of which features resources that are chronologically ordered with the latest being at the top. For instance, when you access ‘English Language Arts’ you will have the choice to browse through the following categories: reading and literature, writing, journalism, and literacy skills. Alternatively, you can use the site’s search functionality to locate specific resources. The Learning Network also features a section for students activities. Resources in this section are arranged into the following categories: Articles and Questions ( features teaching activities for articles from the site), Writing Prompts (features picture prompts, student opinion questions, and current event conversation), Quizzes and Crosswords (includes weekly news quiz, word of the day, country of the week, and student crosswords), Multimedia ( includes what’s going on in this picture? activity, film club, and what’s going on in this graph activity), and Contests. Some of the features in the Learning Network are free like Article of the Day, News Quiz and Student Opinion. Also, educators can read up to five lesson plans from the site’s library for free each month. The rest of the features are subscription based.